Today we’re heading to Brighton at the seaside, less than an hour by train south of central London. I love train travel and this journey is almost too short, through picturesque quintessentially English countryside to the coast. I visit whenever I have the chance, which really isn’t often enough. This time it was because my niece Maxine was visiting from Cape Town. 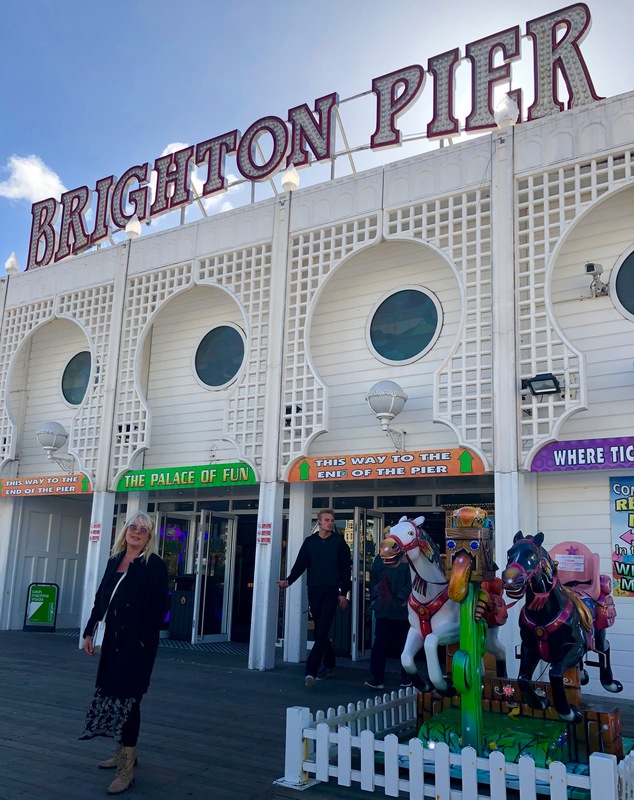 Maxine sees a different side of Brighton to me through her dedication to her favourite YouTubers Zoella (Zoe Sugg) and her boyfriend Alfie Deyes who live locally. While I am clearly not their target market I did watch several vlogs with Maxine and can see their appeal. They have certainly increased Brighton’s popularity among the international youth! And they do recommend places to go in Brighton which makes a good starting point as there are a bewildering amount of establishments to try. There are more restaurants per head in Brighton and Hove than in any other place in the UK with a ratio of one restaurant for every 250 people. There’s also one drinking establishment for every 320 people with over 1,400 licensed premises. See what I mean. 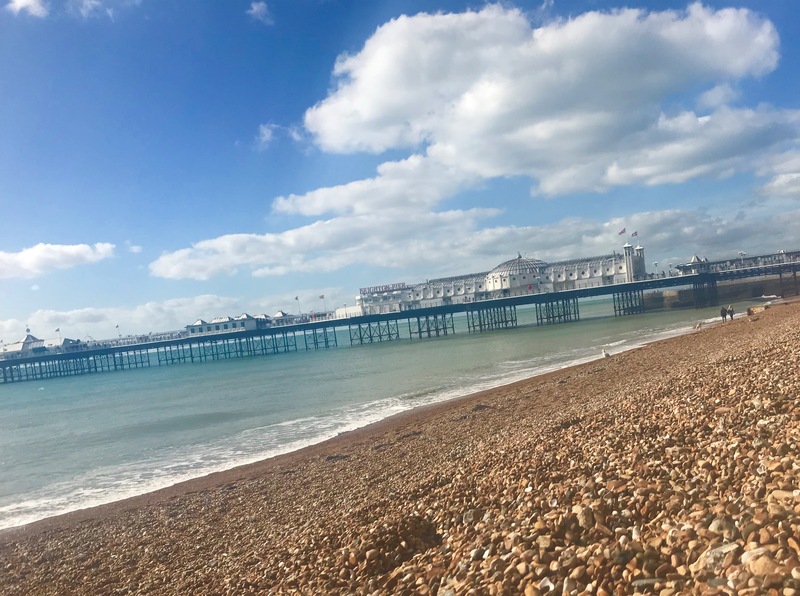 So here’s what we did in our (just over) 24 hours on a bright Autumn day (and night) in Brighton. I love the striking whiteness of the Pier which is 524 metres long, though it seems much longer. Some sort of optical illusion? It was designed by Richard St George Moore and work on it began in November 1881. It finally opened in a grand ceremony on 28 May 1899. The Pier is now a Grade II Listed building that has more than three million visitors a year. It looks particularly sparkly at night – with 60,000 twinkling light bulbs. The arcade buzzes with people playing games, there are thrill rides at the end and there’s a range of quirky shops. 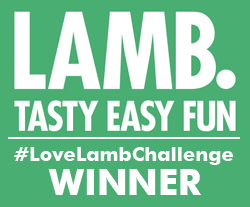 And it’s fast-food heaven – from fish and chips, sausages, hot dogs, burgers, milkshakes, crepes and of course ice cream – there’s plenty to tuck into. The chips are particularly good and it seemed appropriate to wander the pier snacking on piping hot chips wrapped in paper and doused in vinegar. Trust me, you need to do it. 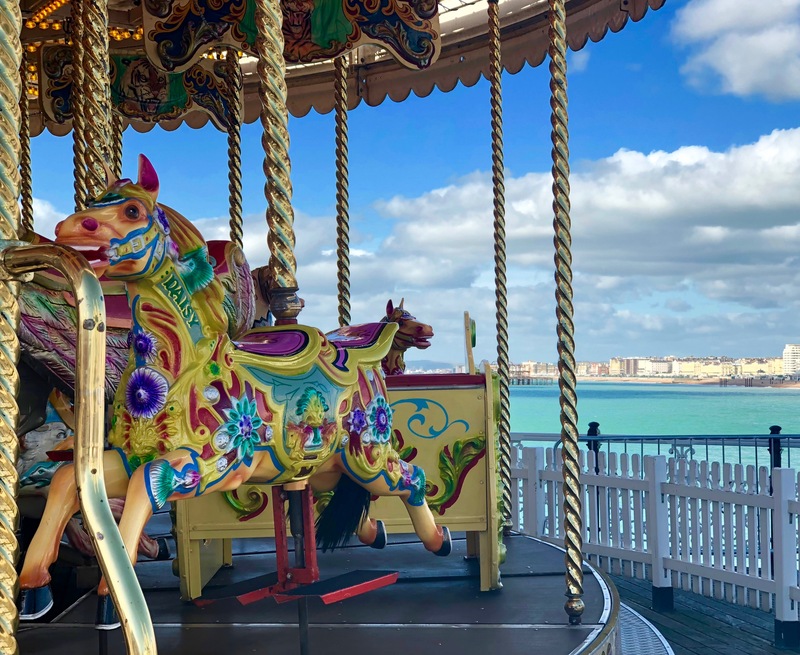 The vibrant colours of the carousel looked stunning alongside the blues of sea and sky. Brighton Beach is a pebbly one so not so great for walking along. No problem, there’s a long promenade alongside the beach to get a good helping of bracing sea air and some endorphin-inducing exercise. The arches along the beachfront have been developed into shops selling everything from the work of local artists, clothes, jewellery, and various souvenirs. And of course, food and drinks, from luxury seafood to ice cream. We were there on a beautifully sunny autumn day so ordered coffee from one of the cafes to take away and sipped it sitting on the beach with views across the sea to the pier. I’m a big fan of a seaside promenade and there’s plenty to see along the four miles between Brighton Marina and Hove Lagoon. 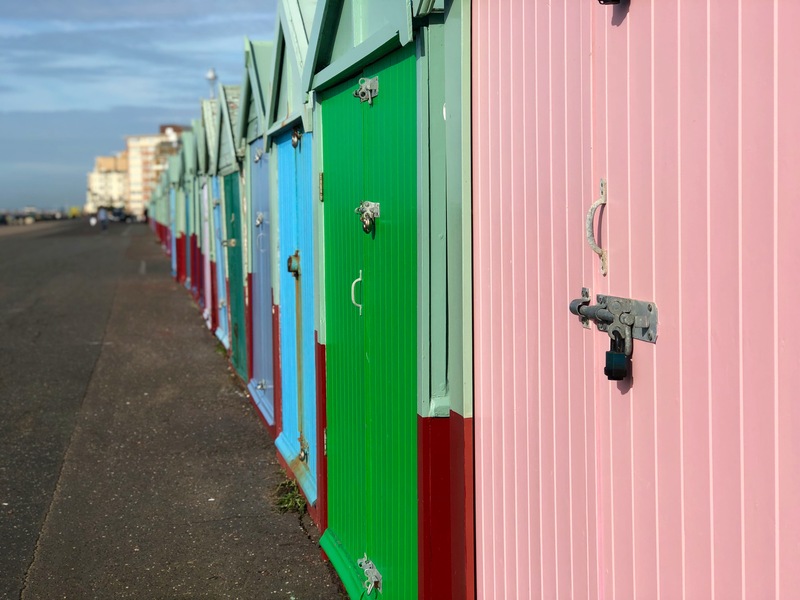 Of course there’s the pier and towards the other end of the beach you’ll find the delightfully colourful beach huts that the area is famous for. The huts are much sought after – well, having a place to shelter even in the middle of the English summer makes sense. There are a couple for sale if you have a spare £18,000! You’ll see the Victorian influence in the architecture everywhere in Brighton. 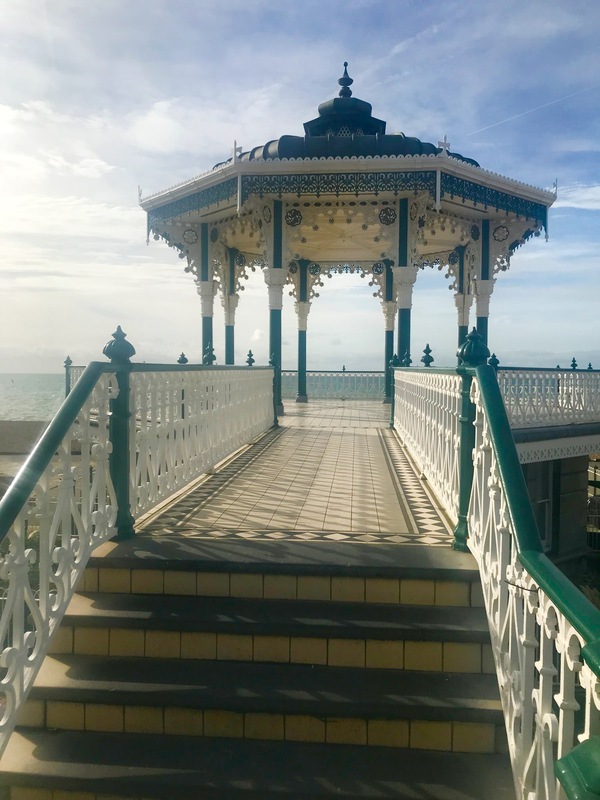 I particularly love the seaside bandstand which first opened in 1884. It hosts a variety of bands every Sunday through the summer and is also available for hire as a wedding or party venue. Even when it’s empty I swear you can almost hear the music playing! 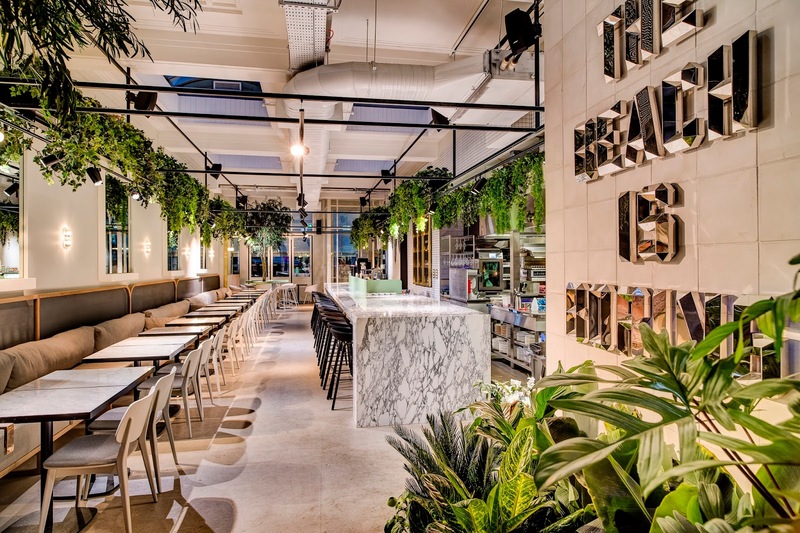 Situated at the bottom of St James Street in Kemptown, Red Roaster is a bright, plant-filled contemporary space with a tasty selection of breakfast/brunch dishes, sandwiches and salads – and they serve great coffee. So here’s another reason for a long morning promenade. So you have the excuse to tuck into one of The Breakfast Club’s substantial brekkies. It’s their first venture outside of London, like all of them doesn’t take bookings and is extremely popular. The no-booking system is one of my pet hates – but as it happens we only had to wait about 10 minutes before being ushered to a table in this cool venue. The menu makes your mouth water, really – it’s taking breakfast to a different level. 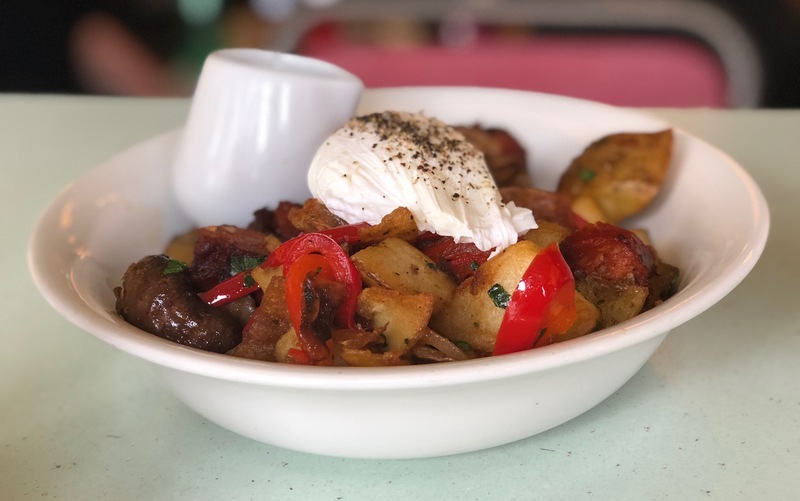 I tucked into this delightful bowl of chorizo hash: chorizo, grilled peppers, mushrooms, caramelised onions and crushed potatoes all topped with a soft poached egg and served with a lemon and feta sauce. Yummy, yummy, yummy, it tasted as good as it sounded. And how’s this for the ultimate comfort food. Disco fries! 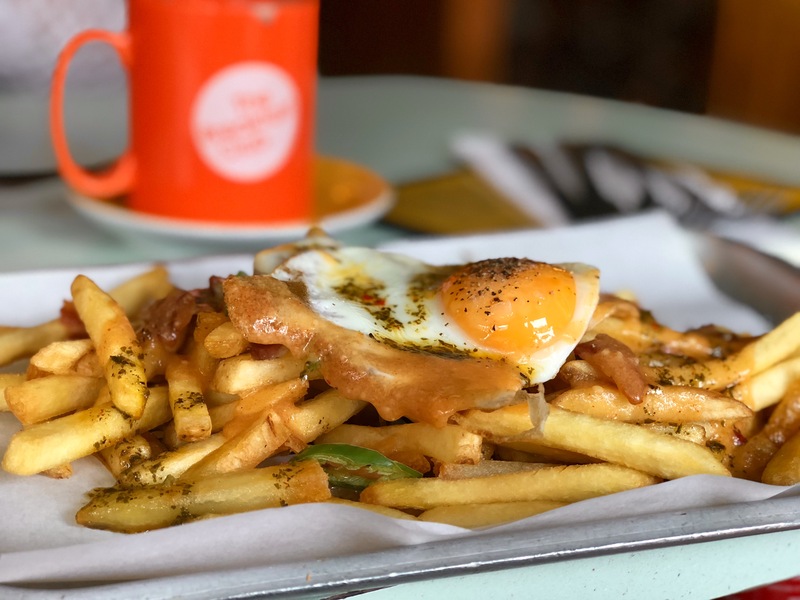 Bacon, beer cheese, fried eggs, skin on chips, chimichurri and spring onions. 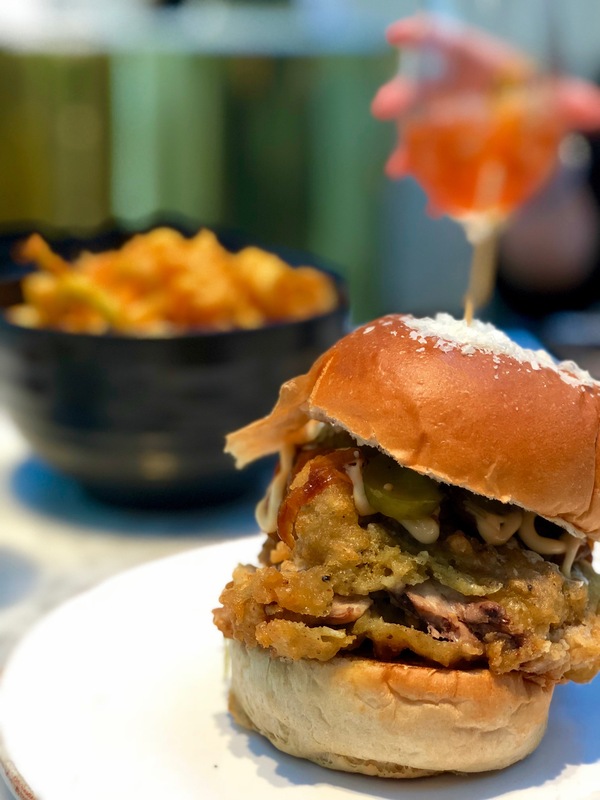 Seems likely this dish was invented as a hangover cure – think I need to go back with a hangover and test it out. The spectacular structure that is the Royal Pavilion does look somewhat out of place in modern Brighton. It was built as a pleasure palace by the sea for King George IV and is a mix of Regency grandeur and the style of India and China. 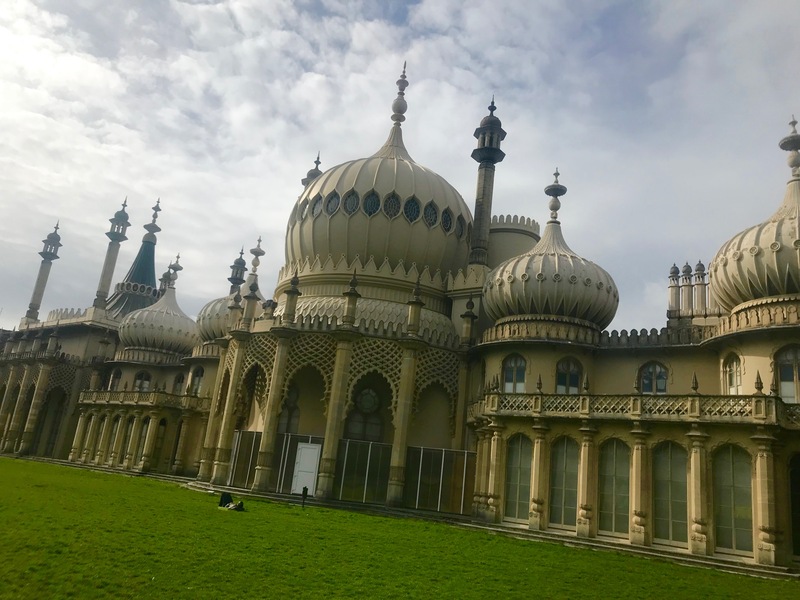 It’s said the Germans didn’t bomb Brighton in World War II because Hitler wanted the Royal Pavillion as his seaside home. Can’t blame him – it certainly has wow factor. Dum Dum Donutterie is a sight to behold. There’s a variety of doughnuts and cronuts (a cross between a croissant and a doughnut) beyond your imagination. 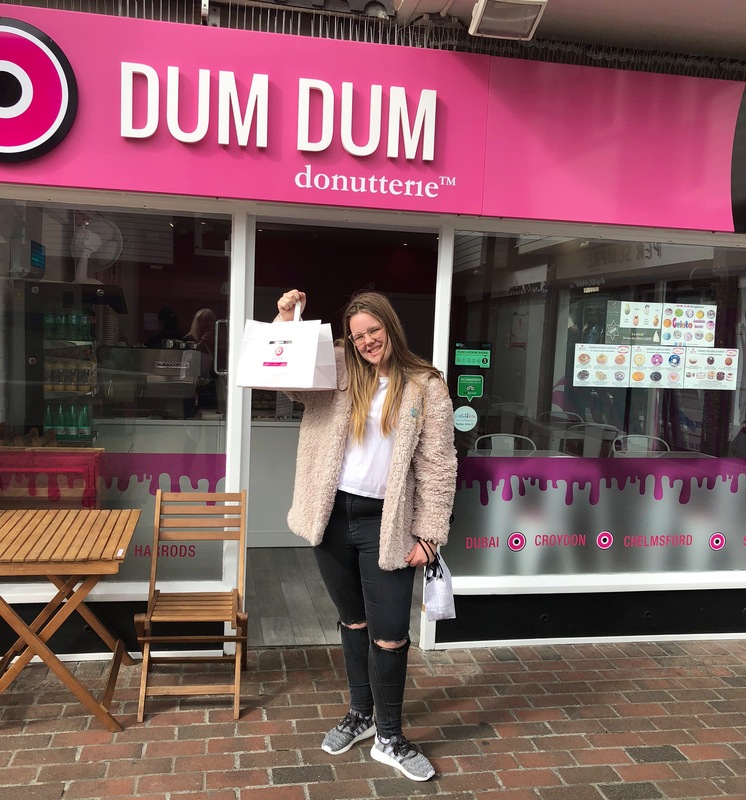 Like the Galaxy cronut that’s made of butter croissant dough filled with blackberry and lemon butter cream and finished with a swirled fondant. 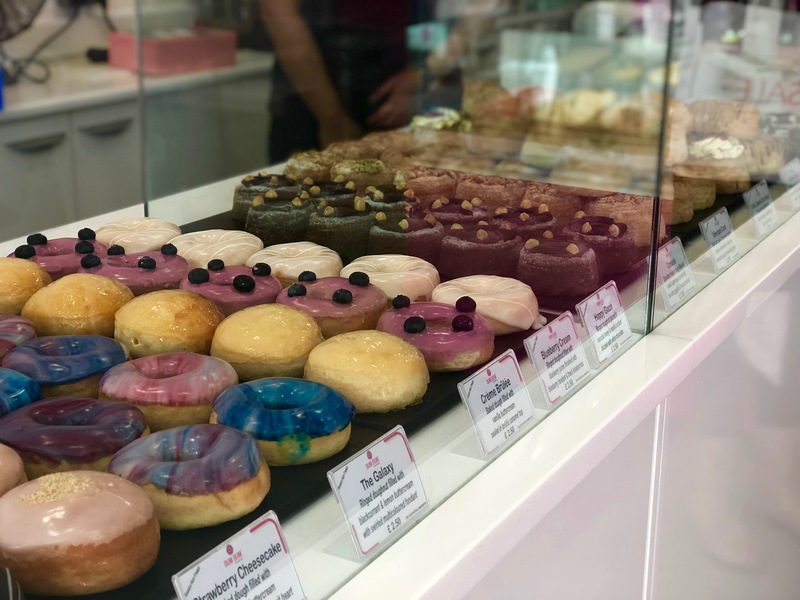 The doughnut selection comes in standard and mini sizes and includes the delectable creme brûlée and chocolate creme options. Eating doughnuts will never be the same again. This famous area of the city comprises a collection of narrow lanes, creating a maze of alleyways and small, quirky shops. At first it all seems a bit bewildering but you soon pinpoint landmarks and realise they are simpler to negotiate than you thought. 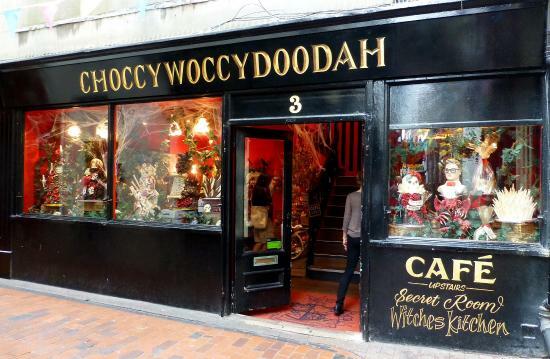 Like Choccywoccydoodah where you can marvel over the fabulously creative chocolate creations. Well, you can’t go to the seaside and not have some ice cream can you? No matter what the season. It’s no exaggeration to say there’s ice cream everywhere you look in Brighton. 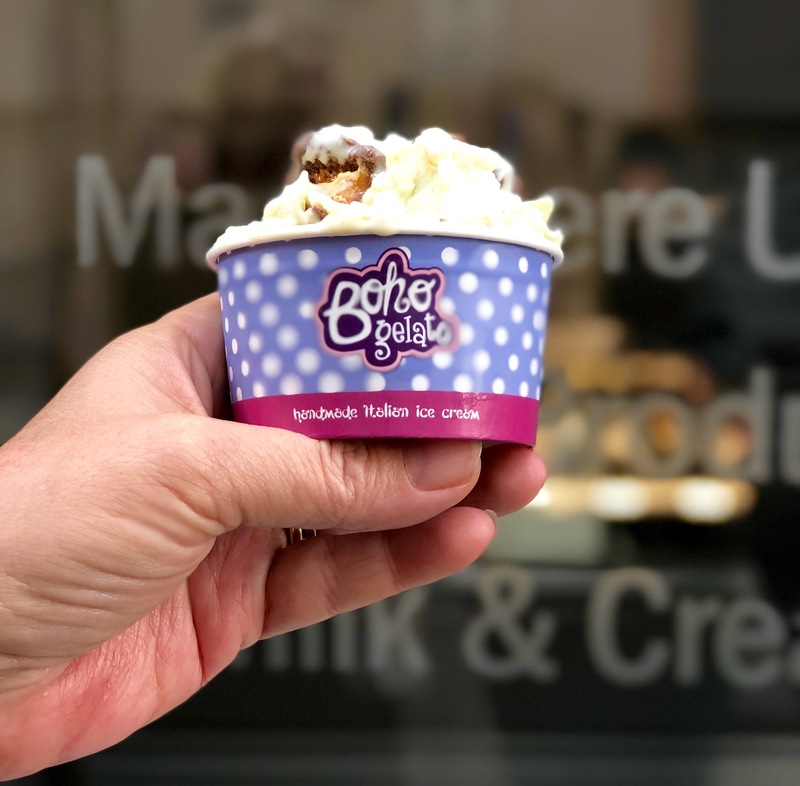 We picked Boho Gelateri for its hand-made Italian ice cream and over 20 flavours to choose from. 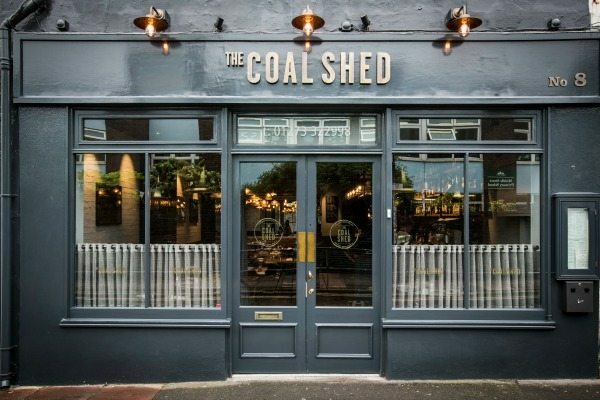 For dinner we decided on elegant steak restaurant The Coal Shed. They describe themselves as “born from the love of cooking on fire”. Perfect. The focus on top-quality ingredients means dishes are kept simple and arrive bursting with flavour. The space is contemporary, yet cosy and the menu easy to negotiate. 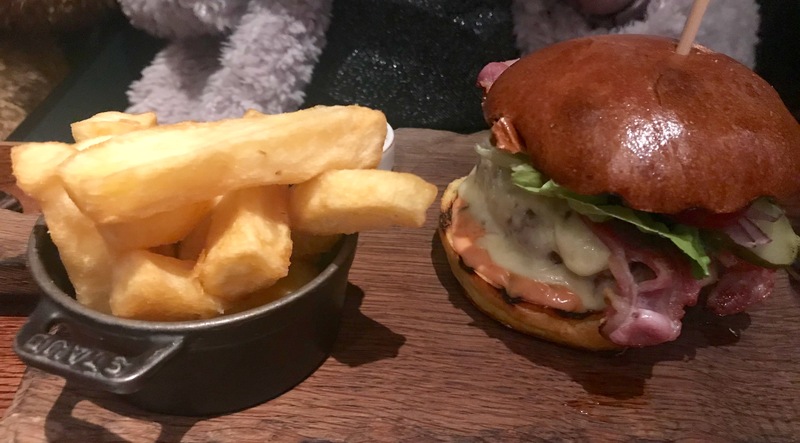 The Black Angus steak burger was served with Bourbon relish, lettuce, pickles, tomato, onion and chunky beef dripping chips. 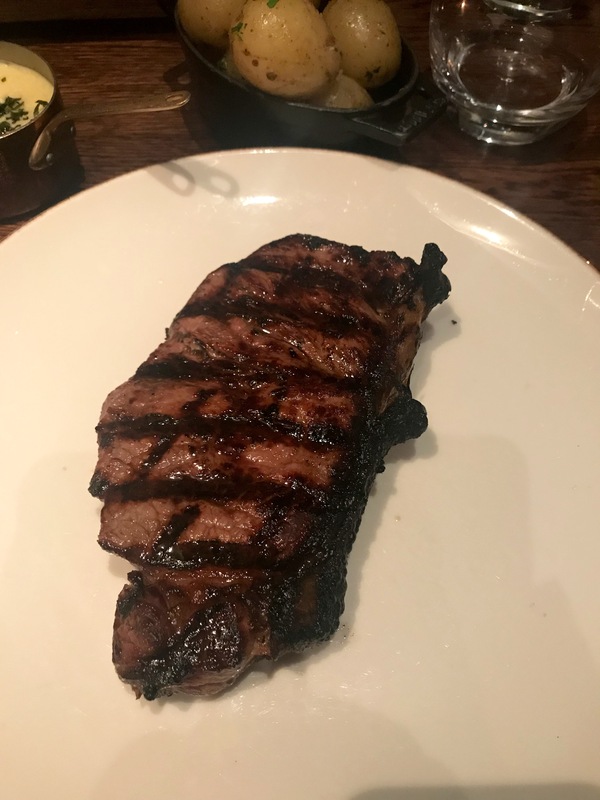 I headed straight for a classic – sirloin steak with bearnaise sauce – one of my absolute favourite combinations. The tastiest of sirloins cooked to perfection and the creamiest of bearnaise. What more could you want? Brighton’s the sort of place I want to keep going back to. I love exploring on foot and it’s a great town to walk around – and a great town to sit around in too! All those bars and restaurants in such a relatively small area – mind boggling! 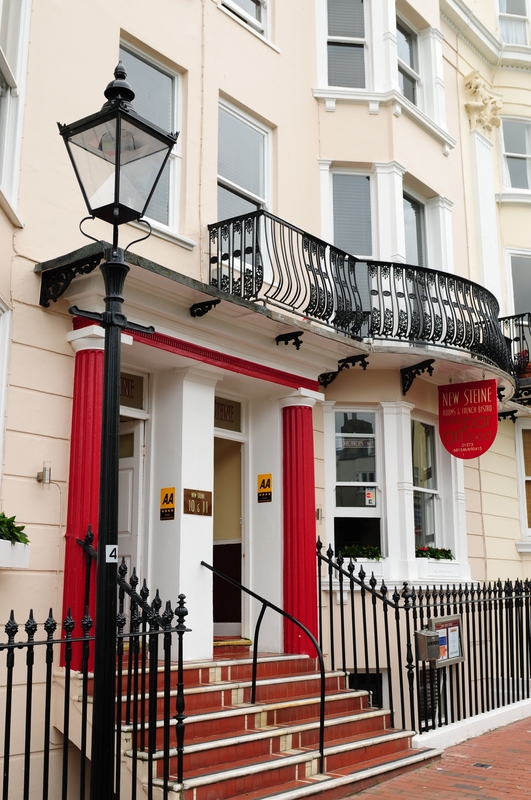 We stayed at the New Steine Hotel which is a five storey Georgian Townhouse in central Brighton, only a few minutes walk from the Brighton Pier and city centre. 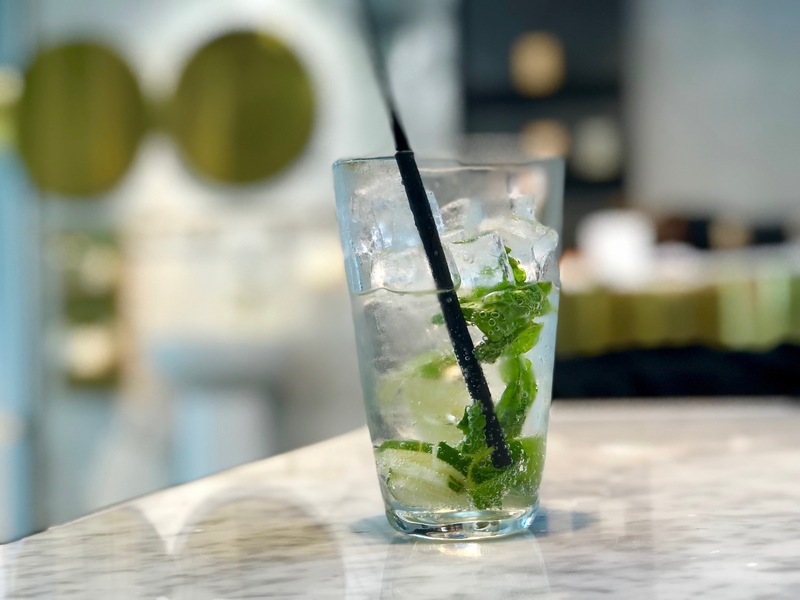 With its French influence and modern chic interior design, it is ideal for all travellers, families or business users alike, and boasts an award winning Sussex Breakfast using local produce, with full options for Vegan and Vegetarian. There are 20 rooms, from modest singles, to Deluxe Twins and Triples, with views over the New Steine Square and the sea. 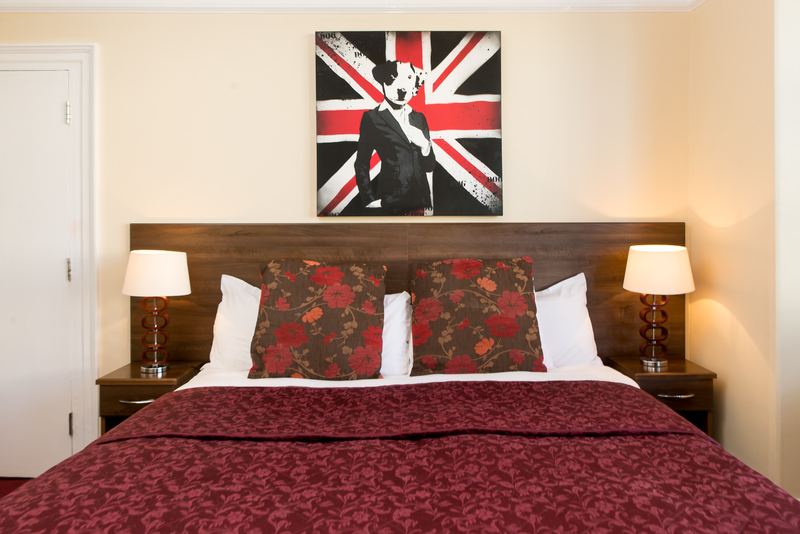 Our ensuite twin room was very comfortable with modern British-themed decor (love a Union Jack), lovely crisp linen, tea-making facilities and a safe. All the essentials covered there. Brighton seems so charming and magical, Sandy! Spending 24 hours there seems like a great idea. Can I see all the highlights in just one day? I’d recommend you stayed for longer if you can but you can do a lot in just one day. It’s an easy city to walk around and most of the main attractions are pretty close together. There are so many amazing restaurants, though, you should stay as long as you can and sample many!